500 Days Of Film Reviews Darren Aronofsky’s mother!, Starring Jennifer Lawrence, Javier Bardem, Ed Harris and Michelle Pfeiffer. A writer (Javier Bardem) and his young wife (Jennifer Lawrence) find their relationship is tested when uninvited guests (played by Ed Harris and Michelle Pfeiffer) arrive at their home, disrupting their tranquil existence. This afternoon, I watched mother! I mention this because - as much as I haven’t been able to stop thinking about Darren Aronofsky’s film since I emerged, stunned from the cinema - I believe that this movie will reveal even more to me in the days, weeks and months ahead. Indeed, at this moment, it would be far easier for me to tell you what mother! isn’t rather than describe what this film is actually about. I can tell you that this movie is not a traditional home invasion thriller. It is not a jump scare fuelled horror. mother! is not a family drama or a tale of love, ambition and obsession. No, mother! is none of these things… and yet it is also, somehow, all of these things in addition to being a biblical allegory and a cautionary tale about the environment. Aronofsky tells his story in such a way that this film is at once (so obviously) about one thing and then, the next moment, definitely about another. Perhaps there is no definitive answer. I’m pretty sure there is no wrong one. Like with so many thought-provoking films, you take away what you bring to this movie. For that reason, it is best to go in blind and let mother! speak to you. However, it is worth noting that mother! is not for the faint of heart. This is an extremely tense, shocking and provocative film with some moments of (the very darkest) dark humour. This is a film by Darren Aronofsky after all. 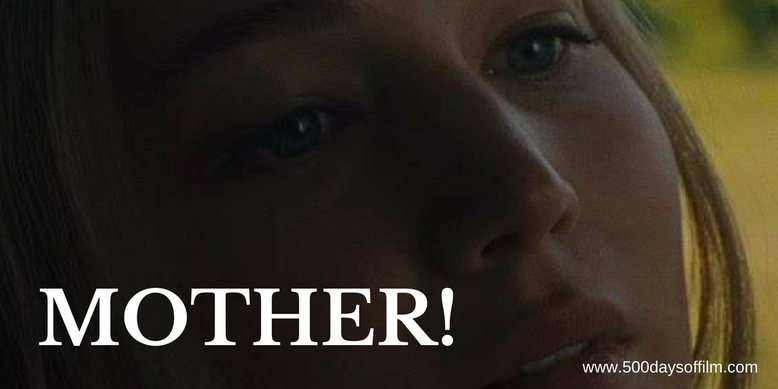 While steering clear of spoilers, it is safe to report that mother! features powerful performances from its formidable and impressive cast. However, it is Jennifer Lawrence and Michelle Pfeiffer’s portrayals that really stand out. Pfeiffer is superb as the divisive and often deeply offensive Woman. She is truly electrifying - how wonderful it is to see her back on the big screen. Meanwhile, Lawrence brings much to what, in lesser hands, could have become a weak and passive role. Hers is a brilliant physical performance, her increasingly desperate reactions perfectly pitched. The house Lawrence’s character (simply called Mother) shares with Bardem’s ‘Him’ is also a (living and breathing) character in Aronofsky’s film. The director brings this unsettling space to life by creating the most exquisite, pin sharp soundscape. While Clint Mansell was so key to Aronofsky's past films (Requiem For A Dream is one example), there is no need for a dramatic score here. Every drip, bang and creak in the house deepens the suspense - starting with intensity and only building from there. Meanwhile, Matthew Libatique’s claustrophobic cinematography gives us no space to breathe - avoiding all traditionally wide, establishing shots and, instead, choosing to focus on extreme close ups or hovering just over Jennifer Lawrence’s shoulder. The end result is dizzying and mother! is certainly an exhausting watch - but I loved every minute. It is unfortunate that mother! has been subject to a torrent of negative criticism since its release (Cinemascore gave it an F grade - the lowest possible score). Of course, everyone is entitled to his or her own opinion. However, even if you loathe mother! surely you must still appreciate Aronofsky’s originality, technical prowess and, at the very least, his breathtaking ambition. mother! is a truly stunning and challenging cinematic experience - this is a film that will provoke discussion and debate for years to come. How many movies can make such a claim? If you have, what did you think of Darren Aronofsky’s movie? Let me know in the comments section below or via Facebook or Twitter (@500DaysOfFilm).